AVB networks rely on a set of standards for cabling infrastructure to ensure that network performance is both reliable and consistent. These standards include specifications for the cable construction itself, as well as specifications for the termination of cabling and physical connections to devices. Deviations from these specifications can result in reduced performance and even data loss, so it’s important to use the right cable for the job, and to use good quality cable that meets the necessary specifications. Cabling that is out of spec can result in dropped packets and intermittent connections. For simple data networks, such as those used to stream video or transfer files, it could just mean increased buffer times or transfer times. For live, real-time audio, it can mean audible dropouts in audio or loss of audio altogether. While AVB itself doesn’t require gigabit Ethernet, PreSonus AVB product do require this speed because of the stream- and channel-counts involved. While this isn’t a function of the cables themselves (the devices and AVB switches handle gigabit Ethernet), it is still an important consideration to keep in mind when building your AVB network because you must select Ethernet cable that is capable of supporting Gigabit speeds. Copper-wire Ethernet networks generally use twisted-pair cable. Twisted pair cabling is a type of wiring in which two conductors of a single circuit are twisted together to cancel out electromagnetic interference (EMI) from external sources, and reducing crosstalk between neighboring pairs. AVB networks require the use of either CAT5e or CAT6 cables, both of which support Gigabit speeds at lengths up to 100 meters, as specified by the TIA/EIA-568 standard. CAT6 is designed to support speeds up to 10 Gb/s (10GBASE-T or 10 Gigabit Ethernet), but it is backward compatible with CAT5e. The primary differences between CAT5e and CAT6 cable are the wire gauge of the conductors and the number of twists per inch in each wire pair. CAT6 cable uses heavier gauge wire and more twists per inch, providing lower crosstalk, higher signal-to-noise ratio, and an overall better performance rating than the CAT5e equivalent. Which type of cable you choose for your application depends on several factors. Network design, installation type (fixed or mobile), budget, and future applications should all be considered when selecting the type of cable you will use. CAT5e cable is usually slightly more cost effective, may be easier to work with, and still fully supports Gigabit speeds, but Cat6 is generally a better choice and is well worth the additional investment given its capacity for faster speeds, especially when considering the future needs from your system. Power User Tip: Always source your cable from a reputable vendor to ensure you are purchasing a high-quality product that meets the industry and engineering specifications it claims by its Category label (CAT5e or CAT6). Never purchase cables labeled CCA (Copper Clad Aluminum), as it does not meet the TIA/EIA specifications for Cat5e and Cat6 cabling. Whether you use CAT5e or CAT6 cable, you will have the option to use Shielded or Unshielded cable. Both cable types can be used for AVB networking and have advantages, depending on the type of AVB installation you are designing. 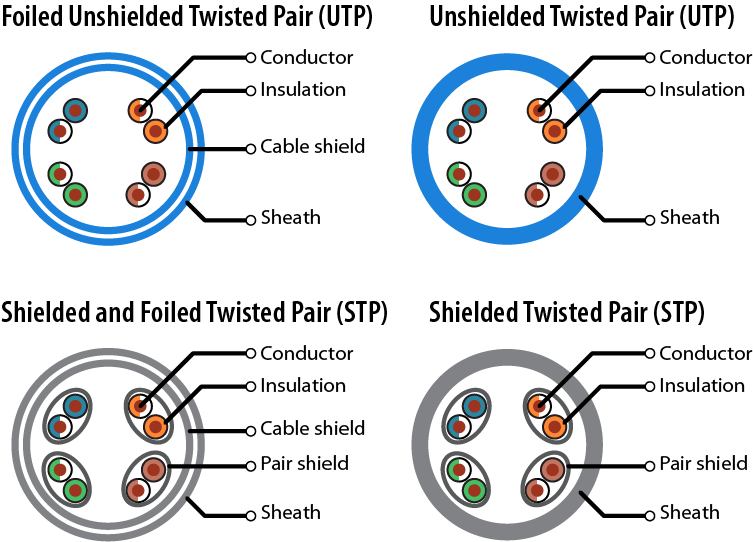 Shielded twisted-pair (STP) cables provide a barrier to help interference, especially electromagnetic interference (EMI). STP cable is constructed with additional electrical shielding along the length of the cable as well as specially constructed plugs that electrically connect and properly ground the cable shielding to the device connected at each end. Originally developed for industrial applications, shielded cable is ideal for fixed installations where Ethernet cable must be run near power, fluorescent lighting, etc. Like a balanced analog cable, STP cables have to be grounded, so you’ll need to use STP-compatible RJ45 connectors. Most XLR-style locking Ethernet connections you will find used on Pro Audio equipment, like the StudioLive Series III mixers and NSB stage boxes, are designed to be able to support both shielded and unshielded cable connections. There are some specific use cases which might call for shielded Ethernet cable to prevent electromagnetic interference (EMI) or radio-frequency interference (RFI) from affecting the performance of the cable. It should be noted that if shielded cable is used but not implemented correctly, it can introduce problems and make things worse than using unshielded cable. As with everything in audio, if you are not experienced in installation or design, it’s well worth the investment to consult a professional who is. SF/UTP. This cable features a braided screen (S) and a foil shield (F) that surrounds unshielded twisted pairs (UTP). Cables with an overall braided screen are great for applications that need extra protection from EMI. S/UTP. This cable features a braided screen (S) surrounding unshielded twisted pairs (UTP). F/UTP (FTP). This cable uses an overall foil shield (F) to protect the unshielded twisted pairs (UTP) and is essentially very similar to a simple UTP cable, offering very little protection. S/FTP. This cable features an overall braided screen (S) encasing foil-screened twisted pairs (FTP). In this design, each twisted pair is protected by its own foil screen to limit the amount of crosstalk between them. F/FTP. In this design, an overall foil screen (F) protects individually wrapped foil-screen twisted pairs (FTP). U/FTP. This design removes the overall screen and relies only on the individual foil-wrapped twisted pairs (FTP) to limit interference. Unshielded twisted pair (UTP) and its cousins, U/FTP and F/UTP are lighter weight and more flexible. These cable types have the benefit of being easier to terminate and much more flexible than their shielded counterparts. What type of cable you select depends largely on your application and the amount of environmental interference you anticipate encountering. 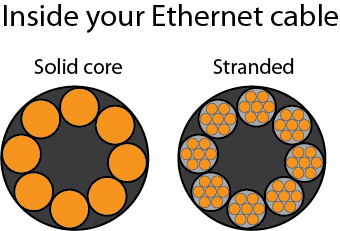 Another thing to keep in mind when selecting Ethernet cable is whether it is solid- or stranded-core. In a solid-core cable, each of the conductors is a single copper wire, which is a better fit for installations and long cable runs (more than 70m). Stranded-core cables use multiple, thinner copper wires for each conductor, making them more flexible and easier to handle. This makes stranded-core cable a better fit for touring and shorter cable runs. Most Ethernet cable is solid-core, constructed using solid insulated bare copper conductors for each of the eight wires in the four twisted pairs of the cable. These cables are meant to be used in permanent and semi-permanent installations, and are designed for longer distance horizontal and backbone cable runs. All CAT5e and CAT6 solid UTP cables are designated with a minimum bend radius for performance standards. The bend radius is the minimum radius a cable can be bent without kinking it, which can lead to damage and shorten its life. The minimum bend radius for Category 5, 5e, and 6 cable is four times the cable diameter, or about one inch. Proper cable installation is essential in order to maximize the performance of the cable. In the case of a mobile live sound operation, with frequent setup and teardown, solid-core Ethernet cable probably isn’t the best choice, as it’s generally stiffer and not conducive to easy layout and flat deployment runs. Solid-core cables should not be over-flexed, bent, or twisted beyond the cable’s recommended specifications, as you risk damaging the cable, causing it to underperform or even fail. When you need Ethernet cable that is intended specifically for harsh environments with repeated deployment, a special type of cable should be considered. Tactical cable generally uses stranded-wire construction for flexibility and durability, as well as employing a heavy, often rubberized outer jacket in addition to the lightweight PVC jacket (sometimes referred to as “up-jacketed”). Tactical Ethernet cable has a very similar feel and handling characteristics to balanced audio cable, and is much more rugged than common solid-core cable used for in-wall building installation, making it ideal for Pro Audio and Live Sound applications. Most RJ-45 connectors are designed to be used with either solid-core or stranded cable; however, you should always confirm the connector’s compatibility to the type of cable you are deploying. Using a plug designed for one type of cable with the wrong cable type can produce unreliable results. The same is true for CAT5e and CAT6 cable connectors. Most RJ-45 connections are only meant to be used specifically with one or the other. Additionally, some connectors are designed for specific wire gauges and cable diameters, so, again, you should always confirm your connector’s compatibility with the specific cable you are using. Power User Tip: Just like sourcing cable, it’s important to source quality connector from a reputable vendor. The connector itself is one of the most crucial pieces in the equation. Even the highest quality cable is only as good as the connections terminating each end. There are two wiring pinouts defined by TIA/EIA standards: T568A and T568B. Currently, T568B is used almost universally in the U.S. - a legacy of analog telephone compatibility - while T568A is more common worldwide. Either is perfectly acceptable as long as you are consistent. If you’re doing a new wiring install, it’s best to choose one or the other and stick with it throughout your network. If you’re making new cabling and not sure about an existing wiring install, don’t worry, it’s even okay to intermingle the two standards for the most part. The most important consideration and the only rule you absolutely must follow is that for a given cable or run, you must use the same wiring standard on both ends. When building your own twisted-pair Ethernet cable, it is crucial that the twists are maintained as close as possible to the contact termination within the plug as possible. You’ll also want to make sure that the wire pairs running to adjacent pins are parallel inside the plug body all the way to the pin. You don’t want different pairs wrapped around each other or have wires bunched up inside the plug and pressed against each other. You might be surprised at how easy it is to create a poor termination and how narrow the window is between a working cable and a failing cable. The crosstalk performance and EMI rejection capabilities of Ethernet cable, which ensure it will function up to its rated specification, are entirely dependent on maintaining these relationships of the wires within the cable and the plug termination. A little attention to detail goes a long way in this respect. Again, if you are unfamiliar with proper termination techniques, PreSonus recommends consulting with a professional.